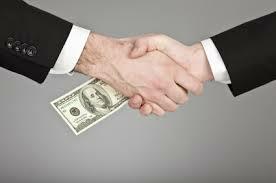 How to deal with bribery? I want to know your opinion, and not only, about a very current problem all of us are facing, including Christians. This is the scourge of corruption, widespread in all life areas. This time I would only limit to the relationship between doctors and patients. It’s easy to say that you are not allowed to give a bribe if you’re Christian and you are healthy, but when you get into the hands of the doctor who just has to perform an operation upon your heart or brain, when your wife is giving birth and has complications, you know from reliable sources that you have to “pay contributions” because otherwise you’re not treated how you should be, what option to choose? You do not give bribe and risk a catastrophe, or you borrow money and give bribe, but do you break the law? A Christian must respect the law. How would you act? Previously I wrote the article What is bribery?, in which I presented that this, according to the Bible is a gift that is given to pervert justice or righteous judgments of people who are responsible for them. When someone is taken prisoner by pirates or terrorists, you do not even think that we could not give the compensation under the pretext that it is unrighteousness or bribe. I met a young man whose uncle was kidnapped by terrorists and demanded a large sum of money to be brought within 24 hours to spare his uncle’s life. This young man made great efforts and found the required money, more than this, he went to the terrorists camp to give that money and to save his uncle from death. It is the same when the life of your friends or even yours depend on the doctor’s intervention. You must save the life and the doctor working with injustice will bear the consequences. I presented a case in this regard in the article What is bribery? Do not give money to pervert right decisions, to do evil, but give everything you have to save people’s lives. It seems that through these verses we are encouraged to give gifts if they open the entrance before great men and if they subdue anger. The author asks me how I would act if the life of the one I love were in danger and the doctor asked bribe to perform the operation or any other treatment. I am happy to say that this has never happened to me and the doctors I asked for help when I needed for myself and for the loved ones behaved very well with us and I always looked with great pleasure to express my gratitude, according to my possibilities. But, if it were such a case when the doctor asked me for money to give the treatment, I would pay if I had the money, and if I did not have, I would make every effort to find to borrow it and I would pay only to save the life and the health of the loved one. But what would the reader do? If you think otherwise, why do you think so?